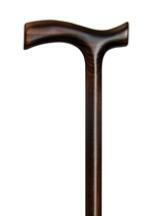 A charming, small scale version of a crutch handle (T-shaped) cane. Ideal for smaller hands, it is very supportive as the user's weight is carried directly over the shaft of the cane. The beech wood has been scorched, resulting in a rich, dark colour. Fitted with a non-slip rubber ferrule, the overall height is 88cm (34.5").